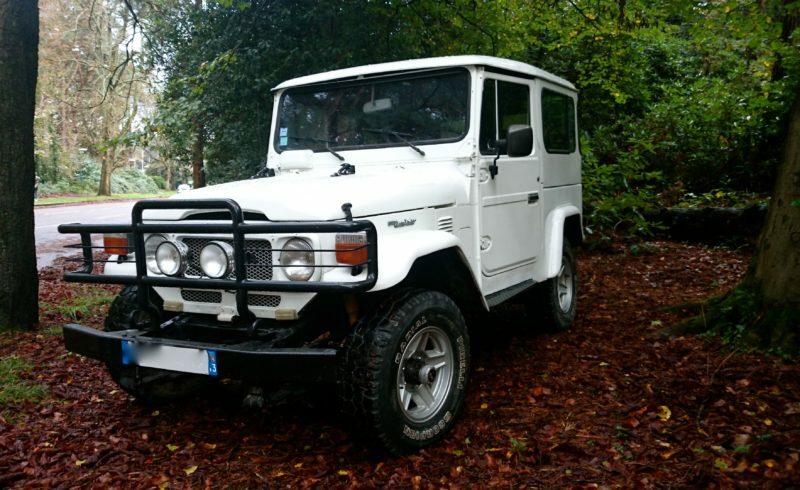 Toyota Landcruiser BJ40 1979 which covered 138,000 km which is around 85,000 miles. It is the highly desirable 3B engine which is a 3.0 litre diesel. Very reliable and surprisingly economicalIt has had some restoration work carried out over the last few years including new drivers side and passenger side floors. It has also had a full respray in white. It has the upgrade of a modern cd player and new speakers with aux connection. X2 new batteries have been fitted, just had the oil changed and filter. There is a tow bar fitted as well.It comes with 12 months Mot valid until the 30th October 2015.We personally imported this car from the south of Europe and travelled approximately 1000 Km in her.She drove very well with no issues whatsoever, these old toyota’s are renowned for their reailablity and off road capabilities. It has selectable 2wd to 4wd and high/low ratio gearbox.It is hard to find a land cruiser of this age which hasn’t suffered with rust issues. But because it has lived in the Mediterranean all its life and has been well maintained it does not suffer with any rust whatsoever!! It has a very good chassis and body.These BJ40’s are getting increasingly hard to find in good condition and rare ones like this don’t come along often, don’t miss your chance!! Would make an excellent advertising tool or classic every day driver.